PS OLOC invites you to explore our history and how it has shaped our mission today. Learn more about our current outreach efforts, leadership in the community and celebrate the old lesbians we have supported and empowered over the years. The PS OLOC board, the Queer Crones Coordinating Council (QC3), holds periodic meetings and an annual planning retreat. The QC3 collaborates with multiple organizations and with the Old Lesbian Oral History Project (OLOHP); members collectively bring close to four centuries of professional and life experience to the work of educating and raising awareness of the PS OLOC mission. 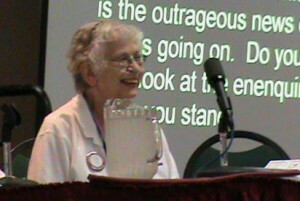 Gloria Stancich, lesbian/feminist activist then living in the Puget Sound area, attended the 1991 International Lesbian Conference (the 1st and only conference of its kind) in Atlanta, GA. There were 2500 registered lesbians. There Gloria first met the newly formed organization, Old Lesbians Organizing for Change (OLOC). Excited by the no-nonsense demeanor and message of this group, she headed for their conference caucus where author Barbara McDonald (author of Look Me in the Eye) was speaking. As she had in her book, Barbara stressed the need of old lesbians to speak out, gain political strength, spotlight the needs and work for the empowerment of old lesbians. Four years later, she became a full member and saw a cause for which she could expend energy to further her civil rights work during the Equal Rights Amendment campaigns of the late 1970s – early 1980s. It wasn’t until 2007 that a few Puget Sound lesbians, who had long been working with other LGBT groups to gain civil rights, met for the first time at the Wheelock Library in Tacoma as PS OLOC. A few women share their thoughts on being a part of PS OLOC. My partner Kelsey and I lived here on the farm in Olalla (Kitsap) for 30 years. She passed four years ago and I had no community. Finding PS OLOC in March, 2014—what a gift! Now I host two PS OLOC-West events a month (bbq’s, cards & games, video—or we go out for lunch together). I had 16 women here—all without (biological) family–for Thanksgiving, 2014. My life is wonderful with my PS OLOC women friends. Ever since the PNW OLOC Gathering in Tacoma (2011), my life as an old lesbian has gotten richer and richer with all the opportunities of meeting old lesbians and supporters, so many things to do and women to do them with; opportunities to stretch my thinking and especially building supportive relationships. In my younger years, I may have hung out in crowded, dim, noisy bars hoping someone would not only notice me but want something a little more. But especially as a single lesbian, connections/friendships seemed to constantly elude or be or short duration. How much nicer and easier to meet old lesbians in the daylight, for us to have matured, grown, gained comfort in sharing friends, especially today, the possibility and safety of being out in public in way not possible when we were young. I say that it’s a great time to be an old lesbian! Thank you, PS OLOC, I am deeply grateful.